Chicago activists speak Tuesday during “Breathe-In: The Fight to Breathe,” a panel about activism amid the Black Lives Matter movement. More than 80 Northwestern community members attended the event, which was hosted by the Black People Making History Committee and co-sponsored by the Center for African American History. 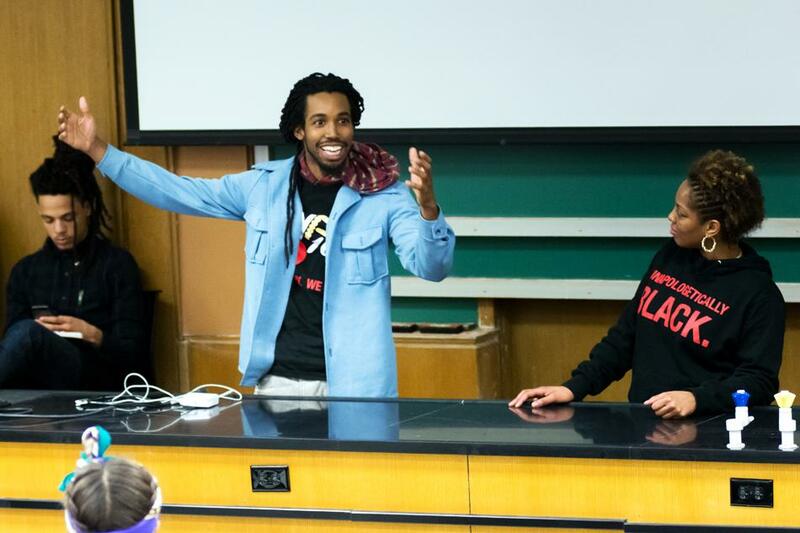 More than 80 Northwestern community members gathered at Technological Institute on Tuesday to listen to several Chicago activists speak about their work with the Black Lives Matter movement as part of the second event organized by the Black People Making History Committee. Communication sophomore Sarah Oberholtzer, who helped organize the“Breathe-In: The Fight to Breathe” event, began the panel by recounting the story of former NU football player Robert Russ, who was fatally shot by a Chicago police officer in 1999. Oberholtzer said she thinks sometimes NU students can become “isolated” from events like this. Brianna Tong, a senior at the University of Chicago, spoke about her work with the Southside Solidarity Network, part of the collective action organization IIRON Student Network. She said the organization is working on several campaigns, including ones regarding environmental justice, corporate accountability in Illinois, worker justice and mass incarceration. Tong also said she is working on a campaign for “equitable policing” on her own campus. Next to speak were Kristiana Colon and Damon Williams of the Let Us Breathe Collective, who discussed their experience gathering supplies for and traveling to Ferguson, Missouri in the wake of the death of Michael Brown. Colon said when she learned gas masks were needed in Ferguson, she set an initial goal of raising $1,300, and ultimately raised nearly $10,000. “Our mission became to support with any resources we could and to amplify their story,” Williams said. Since going to Ferguson, Colon said, the collective has focused on activism in Chicago. She said they held a march on Black Friday and have held theater performances, protests and toy and coat drives. After the panel, audience members broke into groups for breakout sessions with the activists. SESP student Zane Waxman, who helped organize the event, said after leaving NU for two years after his sophomore year, upon returning he was inspired to engage the student body with activism in Chicago. Waxman, who will graduate in 2016, said the point of the breakout sessions was to give attendees a chance to spend one-on-one time with the speakers.